This interview took place on September 9, 1999, via phone from Melbourne, Australia to Lee Perry’s house in Switzerland. When I rang at the agreed time, Lee’s wife answered. She told me told me that Lee was “dancing or something like that”, and asked if I could call back in a half-hour. I did, and after some waiting, the Upsetter himself took the phone. It was a fantastic experience to talk to him, but it wasn’t easy. Even if I could understand the words he was saying, I couldn’t necessarily comprehend was he was talking about, and it was only while transcribing this that some answers became clear to me. I was also a little thrown by the fact that he apparently wants to disown his reggae past, which made some of my prepared questions difficult to pose. That said, some very interesting points were raised, particularly in regard to his burning of the Black Ark, and the pressures of working with a “poverty” music. This interview was recorded for airplay on my reggae radio show “Chant Down Babylon”, set to coincide with Perry’s tour of Australia in late September 1999. JESSE: With me right now on the line, I’ve got one of the biggest living legends of reggae; Lee Scratch Perry, the original Upsetter. Thank you for taking the time out to speak to me Lee. LEE: It’s a pleasure Jess. I found out you have such an interesting show, called Chant Down Babylon. Chant Down Babylon is what I’m doing right now from Switzerland mountain, from my chapel. And I have all the powers that you need to Chant Down Babylon, while I’m in the cluster, hitting the Pope with a knuckle-duster. LEE: Enjoy your reggae show… and have all the fun that you think you desire. And all the people with you on your side, I wish them happiness, and success in this revolution of chopping down Babylon. JESSE: Yes I, it’s fantastic to have you with us. LEE: I will forever be the exterminator of Babylon. JESSE: Yes I. Now, you’ve got a lot of nicknames. They call you Scratch, The Upsetter, Pipecock Jackson, the list goes on and on. What’s your preferred title, what do you like to call yourself ? LEE: Scratch. Scratch means more to me. Because I go by the alphabet and Scratch the S is for the sky. And the S also mean the American dollars. And the S also for space. Which is Scratch, Scratch, Scratch. And also the turntable, the Lion. So I prefer to be called Scratch. JESSE: Right. Right. Now, you’ve been involved with reggae from the very beginning. What made you decide to enter the music business ? LEE: Um Well, from the beginning I wasn’t really a reggae man; I was a soul man from the beginning. But when I see what was in Jamaica, and see all the people suffering in Jamaica, I think that nuthin’ [else] like reggae could help them. So I was starting to get involved in the reggae then I discovered that the meaning of the reggae it mean a strange dog who is designed to kill. So I won’t let the reggae kill me, but whoever the reggae must kill, the reggae must kill. So I’m going back to my place in (?) to record rock music, pop music, disco music, techno music, and no reggae music will be allowed within (?) after I return from Zion. LEE: But the reggae has already done its job. LEE: But there won’t be another reggae artist come back in heaven for sure. You’ll have music that you won’t miss any reggae. I’m going to make music that you don’t miss reggae. JESSE: Alrighty well many regard you as the godfather of reggae. What do you think about those sorts of statements ? LEE: Godfather of reggae ? Who call me.. they don’t call me that ! LEE: I will sue people that do that. LEE: I don’t want to be the godfather of reggae. LEE: Because most of the people that follow reggae they are dreads and they’re too ugly. LEE: I’ve seen this ugliness. Wherever you see you see ugliness. LEE: Too much bad man and the raggamuffin a come out of it. That’s why myself in my original state is a soul man, what I was before meeting Bob Marley the reggae king. Now the reggae kings are dying and the reggae princes are dying, and I don’t want to die in it. But I will assist it to do what it have to do. I used to love reggae, but I’m not a reggae lover anymore, I stop make reggae. LEE: And the show that I’m coming to do, it won’t be a reggae show I’m positively sure. JESSE: So is that why you burned down the Black Ark studio ? LEE: Yeah, because it was built to be a reggae studio, and I find I make a mistake, and burn it down. I don’t want things like that in my house, or my yard anymore. No poverty around me anymore. Poverty is not good. Poverty is the worst crime. And whenever you have anything in poverty, people coming around it. Push it away, otherwise it will bring you down like they were. JESSE: I recently heard a rumor that you were rebuilding the Black Ark studio, or starting another studio. LEE: Yeah, but it won’t be a reggae studio this time. It will be a rock studio, a pop studio, a jazz studio, disco studio, techno, and club studio, or just what happens. I’m not going to go back into the gutter with the sufferers; I’m not a reggae artist anymore. I am black, but I’m not even black anymore. JESSE: Oh really?! Okay. Well, I know that back when you used to do a lot of reggae, you produced some of the most heavy Rasta that ever came out of Jamaica or anywhere else for that matter. LEE: Okay, but out of those reggae that I produce out of Jamaica, I wanted to build the Black Ark studio and there was no money coming from Chris Blackwell and Island Records. And neither from Bob Marley. Bob Marley write Jah Live and die. What a ting dat. Bob Marley write Jah Live and he die. Then what he want to do, him say God send God as a lion ? He write Small Axe, he said and mek the axe chop him. And he sing Duppy Conquerer and the duppy conquer him, so he’s telling lie. But I don’t want I will assist you people to do what you have to do with it, but I’m going back to Jamaica to build the Ark of the Covenant, but there won’t be no reggae musician nor dreadlocks coming through that gate. Say judgement and justice. JESSE: Okay, so you say there won’t be any reggae or any dreadlocks coming through the gate ? LEE: No reggae artist, too lie. And the reggae too thief and wicked. JESSE: Well, I know you don’t wear any dreadlocks, but have you ever considered yourself a Rasta ? LEE: I always wanted to do it, but I didn’t know that’s why all the people who wear dreadlocks it’s a curse them have. I shall not pick up a curse, and my locks shall not wither. Says God’s son of David. My locks shall not wither, and my body shall not see corruption. And I shall not pick up a dread curse on my head. Cause I’m well blessed, I’m not cursed. LEE: I’m defending Jesus Christ. And a few dread defend Jesus Christ and say Jesus exists. And people say who say Jesus no exist, they die because they say dat. Like Peter Tosh. JESSE: Like Peter Tosh ? LEE: Yeah. All people who say Jesus Christ no exist they shall die. While I shall laugh, ha ha ha. JESSE: Right. So what do you think about all the reggae singers over there in Jamaica right now. All the guys like Sizzla and Capleton. LEE: I think it’s finished, I don’t think they have any chance. Maybe though Scratch them ‘ave a chance, but I’m Scratch. And I really decide not to help Jamaican again. I know care who they are. Not even my family I won’t help again in Jamaica. I will not live on through the reggae. And I’m the richest man in the world, I inherit all the money and all the power. And I will not help a Jamaican again as long as I live, so help me God. And as the sun shine, and as the clothes fly. I will never change my hands and help a Jamaican again, never. JESSE: Okay, well you worked with just about everybody in reggae, and produced a lot of the stuff. Is there any of that stuff you look back on now, and you feel particularly proud of ? How do you feel about your great body of work ? LEE: I build all of my life in Jamaica, and I don’t have any of those tapes. They all thief, and sold to Chris Blackwell, and Bob Marley says him write them all. They give me none of the money, I get broke and get what you call bankrupt, and none of them lend me any money. They (?) and laugh at me, so my white fans in England that love me so much, that I would go to England and go to the top of show business, and I’m not responsible for what happens to reggae anymore, I will not (?) and help it. And I am positively sure, the reggae won’t be going as far as where I’ll be going. So when I need money for show business, give me back the Black Ark studio. And I’m not going to take my show business money and go back and put it in a reggae artist. I don’t owe them no favor and they don’t owe me none. They did not vote for me, they vote for Bob Marley, and Peter Tosh, and Bunny Wailer, and Chris Blackwell. So I don’t owe Jamaican reggae no favour. LEE: No favor, and no favor. LEE: I’m not the godfather of reggae. LEE: I have nothing more to do with it. LEE: And the music that I’m going to play won’t be reggae for sure. And people won’t moan and enjoy. JESSE: Right. So when you come out here to Australia, and you play here in Melbourne, what sort of music can the people expect from that ? LEE: Rock, pop, jazz, techno, disco, and everything that sound good international. JESSE: Okay. I know that in the last decade or so, all your performing has you haven’t done much producing, it’s mostly been performing sort of singing and chanting how do you describe your performance style ? JESSE: Can you still hear me? LEE: Yeah, I can hear you. JESSE: Excellent, excellent. I don’t know what happened there, the phone just cut out or something. LEE: Well, um.. maybe the power. LEE: Because the whole thing is obeah. Obeah from Jamaica. And they are trying to pull me back into the reggae. I will assist you people to do what you want to do with the reggae, but I’m not going back into it. I will supply you with better music than the reggae, because I have gotten all the money and all the power. And I don’t want to go back into some things where I see to much poor people a crowd me gate. LEE: I want to create in the year 2000, with a hit record, chart record, top record. Record that can sell a hundred, thousand, millions. Not a reggae album which sell three thousand. When you make a record that sell three thousand, you cannot pay the studio time, and you cannot pay the artist, and the artist say you rob him. Your song is number one, and you only sell three thousand, waste of time, waste of energy, waste of money. And I have no time for anything stupid as that. JESSE: Okay. You say you’re..
LEE: It will have my flavor, and my spiritual feeling, and my spiritual healing in it. That when you hear it you will be able to say “did he change rock music into something else ?” Because you will hear magic. Rock magic music. Pop magic music, Jazz magic music, that you won’t know what it is, you will say it sound maybe like reggae but it won’t be reggae for sure. LEE: It with a space music! Space out. Music make you feel like you want to fly. Music to heal your brain, heal your heart, and heal your thoughts. JESSE: Sounds very good indeed. LEE: Music to make you walk on the air, music to make you walk on the wire. Heh heh heh. JESSE: Now, when you’re walking on the wire, do you often smoke herb ? Do you still smoke herb, I know you used to smoke a lot back in the early days. LEE: Of course I smoke herb. But not much like I used to before. I’m smoking less herbs now. LEE: Smoking less, because those days I was too high, and didn’t see what was happening. While I was getting high they was stealing my tapes. Stealing my master tapes to sell to Mr Blackwell. And after I use up too much of my money, and spend too much of my time, and my energy with them, and get bankrupt, then I discover that most of my tape has been gone. Then I was working with Blackwell, then he had put out Arkology. And he pay me six maybe six thousand.. um.. down on those three CDs. Promised to pay royalty, and we didn’t get a statement nor as much as royalty. LEE: And all those Trojan thousand of LP from Trojan, I never have any royalty off dem yet. And I don’t think I’m going to get any. I don’t want to go back into it, and I don’t want to be the godfather of reggae anymore. JESSE: Right, so you’ve gotta do your own thing now. JESSE: Right. Well, I know that a lot of electronic music these days has sort of grown out of reggae in some ways. How much of a debt do you think the modern electronic music has to reggae music, and dub techniques ? LEE: Well, um. The thing about electronic music, people love it because mostly they’re like the teenagers now. Who want to get in music. They love it electronic music, and they will love it until them hear something better. So when something come better they will accept it, but right now they’re going to love the electronic music. Until something come better. LEE: If reggae can (?) and make the reggae holy, and make the reggae righteous, make it godly and no put no cocaine in it, then the children can like it better. But until we find the right people to make holy righteous music, we’re not going to stop electronic music. JESSE: Right. So these days you’re working mostly with Mad Professor. You’re touring with him when you come to Australia. What attracted you to working with Mad Professor ? LEE: Well, let see. When I was in Jamaica, and after things happen and I get bankrupt, and I made my way to London, he was the one who decide to go out with me, so we could make some money to live. Because I wasn’t getting any money from those records I was making in Jamaica, and neither royalty until now. So he was helping me til then, and til now we be locked into this touring business and the show that we have the best show on earth. JESSE: Yes I. We’re very much looking forward to seeing that show. LEE: You’re going to love it. JESSE: Oh yeah. What can the people expect in Melbourne expect when they see you down here. LEE: What type of people ? JESSE: What can the people expect ? LEE: Me. Kids mostly, cause if I don’t see kids I’m going to get mad. Because I was working for grown up people, but the children mean more to me than grown up people. LEE: I’m more interested in seeing children. Children can understand me more, and I can understand children more. I’ll be happy to see those grown ups who are there, if they play the part of the children, because if the people are humble, they get the truth from me. And if they are (?) they won’t get anything from me. I work especially for children. JESSE: Well, I know my little sister has heard a lot of your music, and I grew up listening to that as well, so it’s going to be fantastic for us to see you out here. LEE: Nice, you’ve got to be kid’s stuff. Must be. Cannot be nothing else but kid’s stuff. I work for children from the very beginning. And I won’t stop. JESSE: Okay. Well you’re in your early sixties now, and you haven’t shown any sign of stopping. Seems like you can keep going forever, what do you think ? LEE: Well, I went up to sixty-three. And when I look pon me age, it wasn’t looking good to me, so I changed it from sixty-three to nine. Because six and three cannot be sixty-three six and three is nine. Do you see what I’m saying ? JESSE: Yes I, I see indeed ! LEE: You’re as old as you think you are, and you’re as young as you think you are. So if I think I was sixty-three, I would throw it in. But I changed my age and say I’m not sixty-three, I’m only nine. Six and three is nine. JESSE: Right. Well that’s part of the secret to staying young I guess, you know how to do it. LEE: Of course! I don’t want to be sixty-three, I want to stay with the children, that’s what I’m saying. LEE: If I don’t see kids there I’m going to get really mad. JESSE: Okay, I’ll pass that message on. LEE: There’s got to be children there. JESSE: Yes, I hope so. JESSE: I’m sure there will be enough people that will be loving to see you on stage. LEE: I’m not sixty-three anymore, I’m nine! Six and three is nine, I reversed my age. JESSE: Okay. So are there any words you’d like to leave for all the people in Melbourne here that are listening to this ? 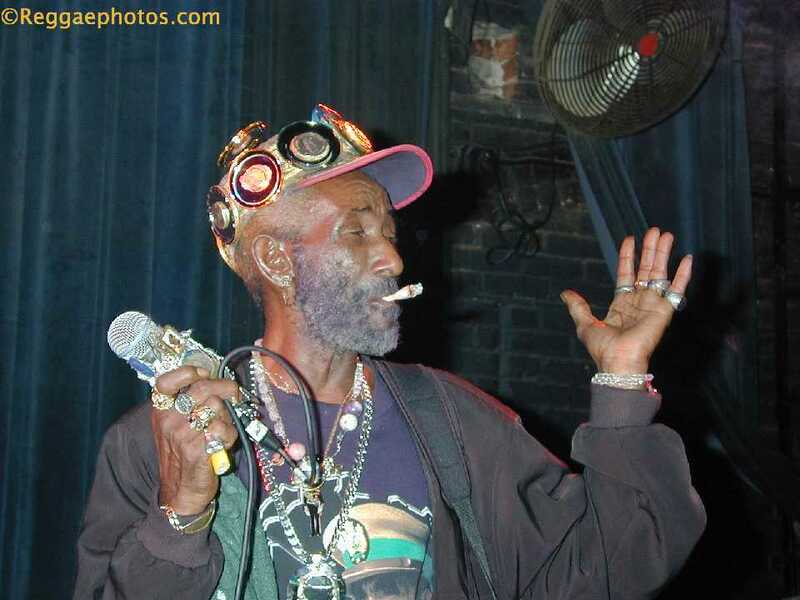 LEE: What I say to the listener, may God bless your ears, listening to Lee Scratch Perry. The richest man on the planet earth, and now millionaire, and the now children teacher, and the now children healer, and the healer of the universe that will heal your brain forever. With music like shower, shower, shower, shower ! JESSE: Fantastic Lee. Thank you very much for speaking to us.